Solar panels like these will be installed on Costco's warehouse. Costco is going solar in Hawaii. Costco Wholesale Corp. has chosen its Big Island store for the company's first solar-electric power system. The 156,000-square-foot Kailua-Kona store is being outfitted with a 680-kilowatt solar electric system, one of the largest such systems to be installed in the state. Issaquah, Wash.-based Costco has hired REC Solar Inc. to install 2.5 megawatts of photovoltaic panels on four of Costco's warehouse locations -- two in Hawaii, including the Big Island and Kauai, and two in California. The two Hawaii systems should be in place by the end of the year, according to Craig Peal, Costco's assistant vice president of energy and building controls. 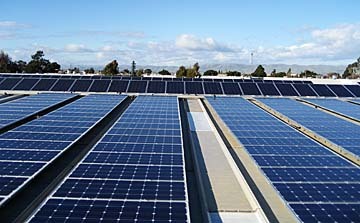 If successful, Costco will look into installing solar panels on its other four stores in Hawaii. Costco Wholesale Corp. is installing a solar electric system on its warehouse at Kailua-Kona, Hawaii, taking a significant step toward being green. Costco has struck a deal with REC Solar Inc. to install 2.5 megawatts of photovoltaics on four of Costco's warehouse locations -- two in Hawaii, including the Big Island and Kauai, and two in California, including San Luis Obispo and possibly Santa Barbara. Installation began the day after Labor Day, according to Noreen Chavez, manager of the Costco in Kona, and should be completed in five to six weeks. "It's long overdue," said Chavez, who estimated the system could reduce electricity costs by about one-third. "In Kona, there's lots of sunshine, and I think we need to do it." Chavez said the Kona store's electricity costs are higher than average because it's on a neighbor island, but declined to disclose the monthly bill. The Costco warehouse in Kona, which measures 156,000 square feet, is being outfitted with a 680-kilowatt solar electric system, enough to supply power to about 111 Hawaii homes. Photovoltaic panels are made up of laminated silicon solar cells that convert sunlight into electricity. Costco is seeking a permit to install a solar electric system on the Kauai store, its sixth and most recent store in the islands, according to Craig Peal, the retailer's assistant vice president of energy/building controls. The solar electric systems for both sites should be completed by year's end, Peal said. If successful, Costco will look into installing more in Hawaii. The Costco project in Kona is REC Solar's first grid-tied Hawaii project and its largest-scale commercial project to date. Based in San Luis Obispo, REC Solar also has projects in Colorado, California, Oregon and New Jersey. But REC Solar spokeswoman Natalie Rozier said Hawaii is emerging as a target area of business. "At this time, Hawaii is one of the best locations in the nation to install solar electricity," said Rozier. She said the incentive for businesses in Hawaii is huge, given the amount of sunshine, generous tax credits and higher-than-average cost of electricity. In Hawaii, commercial photovoltaics are eligible for credits of up to $500,000, and electricity bills can be offset with surplus power if businesses hooked up to the utility grid produce more than they use. The federal government offers an additional 30 percent tax credit. More big-box retailers across the nation are, like Costco, beginning to invest in solar electricity as a way to save costs. Wal-Mart Stores Inc. earlier this summer announced a pilot program in which it would test the use of solar power at stores in Hawaii and California. Other solar-electric systems announced or installed in the state include Castle & Cooke's 1.5-megawatt system on Lanai, a 309-kilowatt installation at Pearl Harbor and a 167-kilowatt system at Hawaiian Electric Co.'s Ward Avenue substation. Actus Lend Lease also is building solar panels into several thousand Hawaii homes with a combined capacity of 6 megawatts. Curtis Beck, manager of energy services for Hawaiian Electric Light Co., said solar is gaining momentum among Big Island businesses that want to take advantage of state and federal tax credits. The Mauna Lani Resort, Big Island Toyota and KTA Super Stores are among them. He said there are 80 customers with net energy metering contracts producing just under 600 kilowatts per hour on the Big Island. Unfortunately, said Beck, the utility's peak energy demand still occurs after the sun goes down, when solar panels stop generating electricity. The typical payback period for a commercial solar electric system is between five to nine years, according to REC Solar. Rozier said that, generally, every 1,000 square feet of roof area can support 10,000 watts of solar electricity. It is not so much the size of a building, but the company's annual electricity usage and desired savings that determine the size of a system. A typical commercial solar system costs between $7 to $10 per watt, said Rozier.